RunDisney races are some of the hottest tickets in the running world, often selling out in under an hour. If you’re a runner, a fitness enthusiast, or a Disney Fanatic, it’s likely that someone, at some point, has encouraged you to participate in a Run Disney Event, and I highly encourage you to consider it. I did just that when I ran my first ever race, the Disney Princess Half Marathon in February in 2015, and it was a life-changing experience. I’ve done a handful of additional RunDisney races since then, and while each race weekend is different, there is one common thread woven through every single race: Disney Magic. Below are fourteen reasons why RunDisney is, without a doubt, the most magical race series on Earth. With race registrations occurring 6-8 months prior to the events, your RunDisney experience starts long before you arrive at the park. 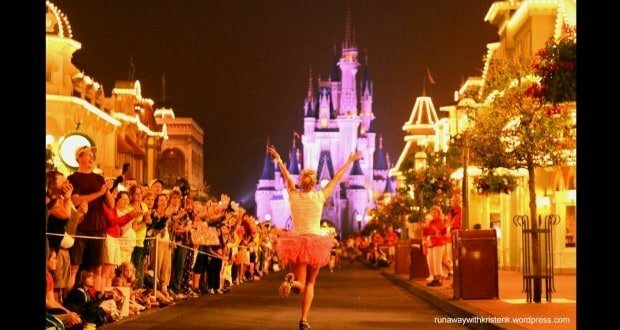 Even though RunDisney races are full of magic, pixie dust, and everything you love about the happiest place on earth, they’re still races, and they require training. This is a great thing, because it gives you something to work for! There’s no motivation like knowing that you’ll soon get to run by Expedition Everest, around Cars Land, or through Cinderella’s Castle. Having a goal, and utilizing a training plan (like the free Jeff Galloway training plans offered on the RunDisney website) will help you to stay in shape and achieve your goal. While many seasoned, competitive distance runners participate in RunDisney events, they’re also a great first race for newbies and beginners. With a 16 minute/mile pace limit, it’s possible to walk your entire race, and still finish within the allotted time. Races are organized into corrals by time, so walkers and slower runners don’t get in the way of the faster runners at the front of the pack. If you happen to fall behind the time limit, the infamous “balloon ladies” are there, walking a consistent 16 minute/mile pace, to encourage and motivate stragglers to pick up the pace and keep going. Every race weekend has multiple events, ensuring that there is something for everyone in your group. RunDisney kids’ races offer 100-400 meter dash events for children ages 1-8. For the smallest Disney athletes, there’s a “diaper dash” crawling race. For adults, older children, and teens, there are at least two, and up to four race distance to choose from; usually a 5k and a whole and/or half marathon, and sometimes a 10k. Non-runners in the family, can still feel included by signing-up to join the Cheer Squad. A Cheer Squad ticket gets you prime viewing placement along key course milestones, like inside the parks and at the finish line, and comes with fun cheer accessories, like a blanket, bag, and clapper, to cheer on your favorite runner. In true Disney fashion, RunDisney really has thought of everything. Every race weekend features either restaurant “pre-race” meal specials, or a “Pasta in the Park” party option. Pasta in the Park is a ticketed buffet event, featuring character meet and greets, and often includes special seating for a fireworks show such as Illuminations. For race weekends that don’t include Pasta in the Park, many restaurants around the property offer special pasta menus and/or carb heavy buffets for runners and their supporters to fuel up for the big race. In addition to all of the amazing things available for purchase at the race expo, runners also receive some great swag, included in their race registration fee. The official race shirts are, depending on the season, long or short-sleeved, high quality tech tees (or t-shirts for 5k races), with cool, “Disneyfied” custom race designs. Most races also come with additional swag perks, like a drawstring backpack, or a complimentary post-race alcoholic beverage (I’m look at you, Wine and Dine Half.) Post-race, you’re also offered full bottles of spring water or sports drink, bananas, cooling cloths, and a delicious, nutritious, and fully-loaded recovery snack pack. With Disney cracking down on rules regarding adults dressing up in the parks, it’s getting harder and harder to channel your inner Disney spirit-animal while abiding by park regulations. A RunDisney event is the perfect excuse to go all out and fulfill your Disney costume dreams! Creative, family friendly race outfits are not only allowed, they’re encouraged, so go ahead and dress to impress. If you’re running with friends, family, or a team, why not coordinate and dress as your favorite movie cast, or group of character? There’s nothing like hearing spectators screaming, “Go, Snow White, you’ve got this!” and then looking down at your costume, and realizing they’re cheering for you! One of the cooler things about RunDisney races is that for most of them, you get a chance to run in the parks before (or after) they’re open to the public. Without the throngs of slow moving park guests, you get some beautiful and unique views of park attractions that you’d never get during regular operating hours. This makes for some incredible photo opportunities. Additionally, during most races, you get the special treat of running in “behind the scenes” backstage areas that are usually reserved for Cast Members. Behind the scenes, you might get to see all kinds of interesting things, from staff dining areas, to parade floats, to props and décor of Disney attractions past. These races are quite possibly the most entertaining running events in existence. For starters, every corral of runners gets their own fireworks display at the starting line! Now that’s a sendoff! Out on the course, with characters at every mile, there are multiple opportunities to stop for pictures with both popular and normally harder to find characters. Additionally, Disney employs local high school bands, choirs, and cheerleaders to entertain and motivate runners along the way. During Disneyland races that run through the city of Anaheim, you may run into other groups cheering racers on and lending support, such as the famous “Red Hat Society,” or the Anaheim Ducks Power Players. Wear your medals around the park, and cast members will congratulate you FOR DAYS. I am not exaggerating. Ride attendants, characters, servers, hotel staff- they will all commend you on your medal, high five you, and just make you feel like the most awesome person on the planet for the duration of your visit. I’d imagine this is what it feels like to be famous. You’ll truly feel like a star. The TSA agent at the Orlando airport even commented on my medals on my way home from Princess Half Marathon weekend last year! When it comes down to it, what is really at the heart of every Disney vacation is the special time you get to share with family and friends. Registering for a RunDisney race provides you with a perfect excuse to return to your favorite Disney Park, or visit one you’ve never been to before. (In fact, that’s how I finally ended up taking my first trip to Disneyland last year. Thank you, Tinkerbell Half!) This year, there’s even a race weekend at Disney Paris! A RunDisney race offers a perfect opportunity to pack up your family (or friends) and spend a day, weekend, or longer making one of a kind memories with the people you love the most. Because that’s what it’s really all about, isn’t it?